Even if you give it a good clean, it can be difficult to get rid of the lingering smell of cat pee. Luckily, the experts at Good Housekeeping have some tips if this is something you’re struggling with. Of course, if you really don’t want to try and tackle it yourself you could pay for steam carpet cleaning in Liverpool, although that might be a good idea regardless just to give your whole carpet a fresh start. 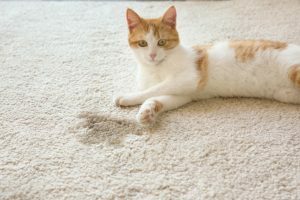 The key to getting rid of cat pee stains (and the smell) from carpets is to use an enzyme cleaner, according to the magazine. Soak up as much of the stain as you can before you start, then spray the product on the offending area. Gently rub the stain with a clean, damp cloth to get rid of as much of it as possible. Once you’ve done this, cover it with a damp towel and let it sit for 12 hours. If your kitty has also had an accident on your sofa and you can’t remove the covers to wash them, follow the same steps to help remove the offending stain from your upholstery too. You might not have this issue at all with your cat, in which case, great. But one thing you may want to do before you have guests over is give your upholstery a quick clean to remove any lingering cat fur. Grab a lint roller for a quick and easy way to remove the fluff. This entry was posted in Advice and tagged steam carpet cleaning liverpool. Bookmark the permalink.